On our constant hunt for lesser-known khao gallis in Pune, we stumbled upon this lane, opposite Yerwada Central Jail and the SBI ATM there, buzzing with tiny roadside establishments selling the most delectable and affordable street food ever. Read on! Treat your taste buds to some Italian street fare at Pizza Cottage. Affordable and delicious, we tried their BBQ Vaganza pizza for INR 130, overloaded with chunks of chicken, caramelized onion, capsicum, cheese gratings and red chilli flakes. Many of their loyal patrons swear by the Schezwan chicken pizza for that extra spice and flavour. Located right next to Pizza Cottage, this kiosk is perpetually crowded at all times of the day. When we asked why, we were told that many recommended this bestselling combo of chocolate and peanut butter milkshake for INR 50 along with their cheesy chicken burger for INR 60. The verdict? Definitely, gets the LBB stamp of approval. Perhaps one of the biggest food joints in the area, SP Chinese & Indian Food is known for juicy, spicy tandoori chicken for just INR 200. What we loved the most that they are very particular about hygiene. 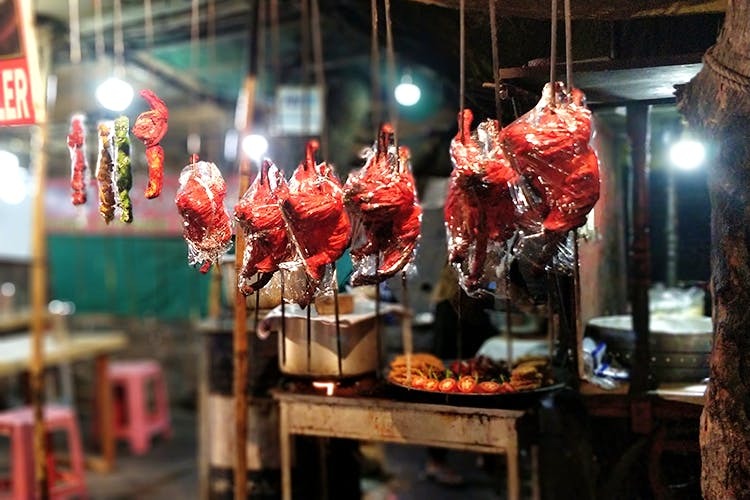 The grilled chicken is wrapped in cellophane first and then put on display, unlike other street food joints that almost never do that. For a belly-filling lunch, we recommend you try Alifya’s Kolhapuri chicken thali for just INR 100, comprising of a boiled egg, chicken curry, three rotis, rice, salad and pickle. How cool is that?!? We stopped by at Mhatre Dosa Centre for a quick evening snack. They have six kinds of dosas including the Loni paneer dosa for INR 60 and Loni cheese dosa for INR 40. End your food walk with a mouthful of maghai paan from SK Paan Shop. Priced at INR 20, this one was quite different from the usual meetha or Calcutta paan. In fact, we did get a hint of spiciness in the taste! Make sure you check out the chaats, pav bhaji, burger stall and the tawa pulav stand.